Mary Manning is an artist who works in watercolors, acrylics, and oils, with a twist: she accents many of her works with gold, silver, and copper leaf gilding. She has paintings in private and public collections across north America and around the world. She began drawing and painting in childhood, excelling in portraits of pets and people. Like Picasso, she developed her own ways to interpret landscapes and people, flowers and birds. She learns from Klimt, Georgia O'Keefe, Rembrandt, Da Vinci, and many other artists, contemporary and classical. She is a member of the American Watercolor Society, the International Society of Acrylic Painters, the Southern Utah Art Guild, and the Dixie Watercolor Society. She enjoys painting in her home studio and outdoors, carrying her paints and easels with her. She has been elected Vice President of ISAP. "Nature and the incredible beauties of the West inspire me constantly," Mary says. After a 34-year career as an award-winning journalist for the Las Vegas Sun Newspaper (on the Pulitzer Prize winning team 2009), The Bulletin of Atomic Scientists, and Nature, as well as national and international publications, 10 years ago Mary began her full time career as an artist. She always drew and painted, first realistic portraits and then developing her talents in abstract landscapes. 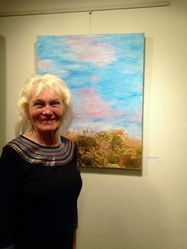 She began serious studies in Chinese and Japanese art and design at the University of California, Berkeley and then Stanford University in Palo Alto, Calif. She studies with acrylic artist Nancy Reyner of Santa Fe, N.M., and watercolorist Roland Lee of St. George, Utah, Richard Schmid, and Cody DeLong of Jerome, Arizona. Her works hang in private and international collections. “I never want to stop studying and trying new materials, methods and movements on paper and canvas,” Mary says. Recent shows include juried into “Monuments” exhibit in Las Vegas and Mesquite, NV; Zion Canyon Community Center, Springdale, UT; solo show at The DiFiore Center for Arts and Education, St. George, UT. In addition to working on her art, she studies Archaeology, focusing on Petroglyphs and pictographs in the West and around the world. “The artist’s eye is perfect for teasing out these ancient marks left by people hundreds to thousands of years ago,” Mary says. When she is not drawing, painting or studying, Mary plays Native American flutes, studies modern American poetry through the online course offered by the University of Pennsylvania, and enjoys her family, including a husband, Larry, a cat raised from three weeks old, and her daughter and her husband. She divides time between Las Vegas, Nevada and southwestern Utah. Concerned about preserving public lands, Mary is embarking on a series of paintings called, “Monumental,” including pieces about Gold Butte, Nevada, Bears Ears National Monument in Utah, Grand Staircase Escalante in Utah and other natural wonders.